The Fifth House is commonly referred to as the House of Pleasure. Oftentimes, pleasure is the result of a creative act. The simple act of creating is, essentially, giving of oneself and making something - making another? Yes, the Fifth House does speak to procreation and children, but it also addresses the creation of art and culture. The creative life is one from which we can derive much personal pleasure and self-satisfaction. Do I like this? Does it make me feel good? Does it bring me pleasure? The answers therein are the domain of the Fifth House. Taking this pleasure principle a step further, one can give it a more human face, even two faces. 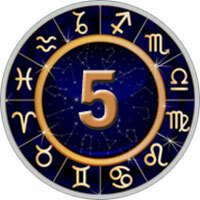 Romance and romantic affairs, both emotional pleasures, are within the realm of the Fifth House. Emotional satisfaction can be gained in many ways, and yet another way addressed by this House is gambling. While this implies a financial risk, it can also be viewed as the willingness to take a risk - on love, with money or in life. A gut risk in the hopes of a pleasurable outcome is how the Fifth House sees it. This House is actually quite rich with pleasures since it also lords over fun, games and hobbies. Life is more than just being or doing, it also includes finding - finding the pleasure in the acts in which we engage. Children as a source of pleasure are also important in the Fifth House. This brings us back to creativity, since through our children we create an extension of ourselves and then watch it grow. Giving our children all the good we had (and have), and then some, is certainly a pleasurable pursuit. How will this manifest itself? What form of pleasure and emotional release is best for our children? Music, dance, theater, art, science, literature - these fancies are for them and for us. Play for the purpose of emotional enrichment and pure pleasure is what the Fifth House is all about. A prominent fifth house can give you a larger-than-life persona, and make you memorable to others. You’ll have a strong need to tell your personal story, and do it in a dramatic way. There’s a tendency to go overboard and constantly seek approval. But whatever you do has an authentic stamp, and this makes you attractive to others. A strong fifth house also points to leadership, and qualities of regal bearing, self-respect and general confidence. The Fifth House is ruled by Leo and the planet Sun.